I’m currently on blog break to be with family. I’m celebrating the holidays, Christmas and new year with the whole clan so I’ll be not around here for some time. I wish you all a very merry Christmas and a prosperous new year! It’s been quiet around here for sometime eh. I have been so occupied with work and need to do a lot of things before I go on a short leave for the holidays. I will be spending christmas and new year with my family back home and will not be around blogging during those times. I will not be around for the next two weeks but would like to share a project that I did make for The Stamping Shack blog. I have been wandering around to do printing on fabric and did finally try one on this project. Here I used Pirate Boy digistamp from the Stamping Shack store. You can use whatever digistamp image you would wish and customize the same as you would want them too. 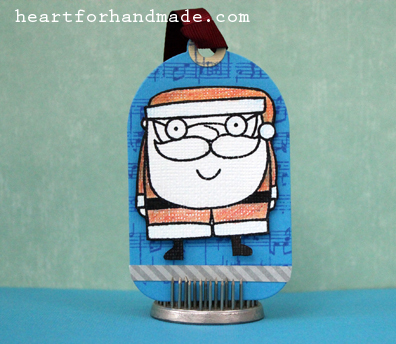 You can visit The Stamping Shack blog to see the process I did on this one. This is it for now and I wish you all A Very Merry Christmas and a Happy New Year! For today’s card I’m highlighting the Postage Elf digi from The Stamping Shack. This is my second time to use the Postage Elf, I have used it here in my Holiday Mini Cards that can be used to write your greetings when sending out your holiday gift. I have colored my image with watercolour pencils. Here, I highlight the digi by putting it into a frame, embossed the background and added minimal decor to keep a clean overall look. 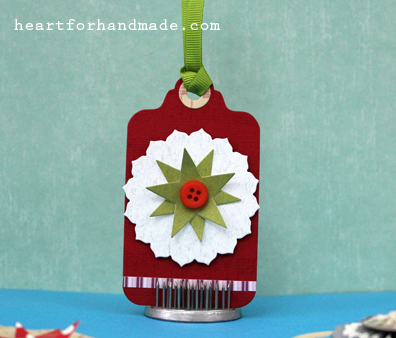 Note that from 15th December, there will be a card challenge at The Stamping Shack blog with the theme ‘Let the Holiday Begin’. Be sure to drop by at their blog on how to join in. I’m entering this card in Retro Sketches challenge # 41. I came across the Freshly Made Sketches blog (Sketch # 64) through one of the many blogs I’ve visited lately and decided to play along. Sorry I should have noted where I found the link from so I can give her credit too. 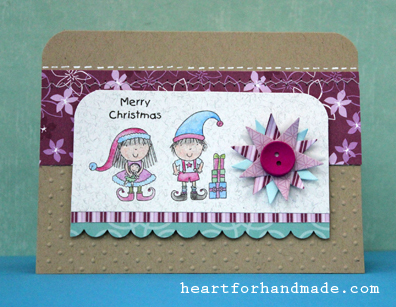 On this card, I used a digistamp Christmas Elves from the Stamping Shack store and colored them with non-traditional christmas colors, pink and blues. This particular digistamp will be on special from Wednesday, 12th Dec midnight GMT so go check the store to grab these darling. 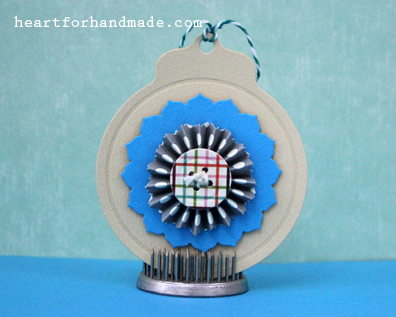 Inspirational projects will be at the Stamping Shack blog too so be sure visit them on Wednesday. 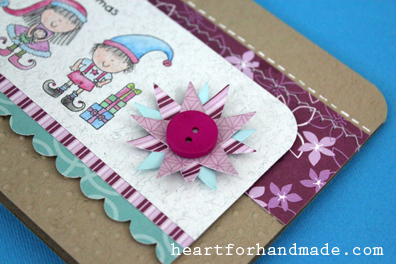 For the flower-like embellishment, I use 5 layers of diecut stars layered on top of each other then finish them off with a colored wooden button. The background pattern paper was adhered directly on the base but I ran a zigzag stitch using my sewing machine for some texture. 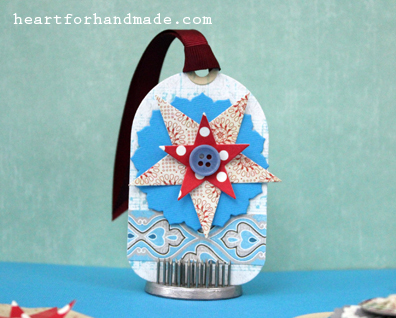 I’m entering this card too at Lawnscaping Challenge # 47, to use the colors turquoise, kraft and red. Now off to my card. Only a few hours before deadline but I’m joining here again at Retro Sketch Challenge # 40. I used different stamp sets from Paper Smooches. 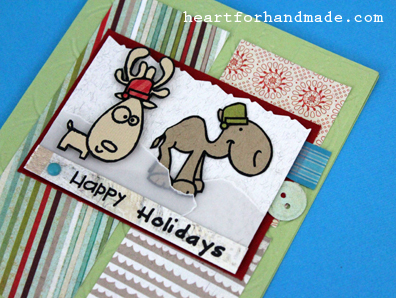 I stamped and hand cut the deer and camel, alogn with their holiday hats. Oh, and I dont have enough holiday greetings that matches Paper Smooches font type so I wrote the word ‘Holidays’ instead. The background has embossed christmas trees. I added vellum as snow banks at the bottom to give another holiday feel. Anyhow, off to my card. Caution, a lot of photos on this post. I used tag dies from Papertrey Ink to diecut my base tags. 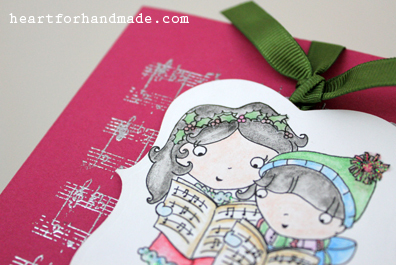 For additional background texture I stamped them with musical notes stamp and some were even embossed. I kept them simple but tried to make a variation of each just to see how well it looks overall. To add dimensions, I made some of the stars overlap on top of each other. 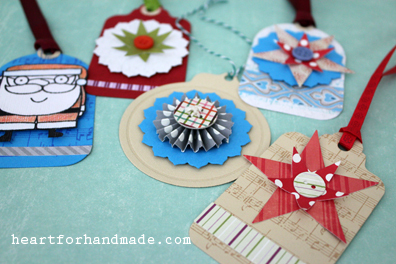 So without further ado, here are my take for the gift tags challenge. 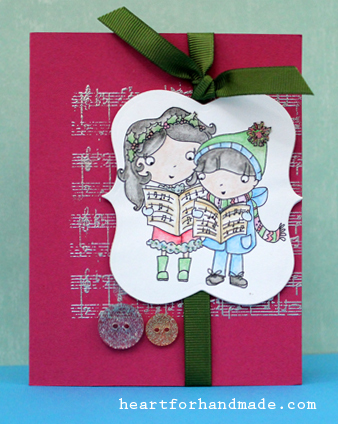 I’m using another digistamp from The Stamping Shack called Carol Singers. 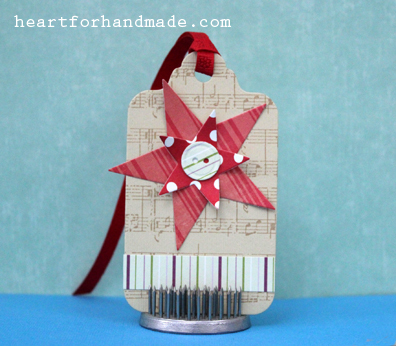 Beginning 1st December, there will be a Sparkle and Shine challenge at The Stamping Shack blog. Be sure to check them out and have the chance to win some of their sweet digistamps. For my card background, I embossed part of the base with silver embossing. It gives just a right texture and shine without being too shiny. I colored my carol singers with watercolor pencils, put some glitter glue on their dress and glossy accents to the litte girl’s head dress. I found glittered buttons on my stash and decided to add them too for some extra embellishment. I’m entering this card to Retrosketch # 39. I love working with sketch challenges so whenever I have the chance, I join in for fun.